This week’s QUOTE FOR ANXIETY! Well, this really is great advice to take one day at a time, because it really is pointless worrying about the future. Why waste your time worrying, when whatever you’re worrying about might never happen! Dealing with panic or anxiety attacks. An anxiety or panic attack can be quite debilitating, especially as it can give rise to another anxiety, namely fear of having a panic attack. 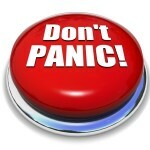 But there is help… A panic attack is the physical response of having too much oxygen in your system. Think about it… when you panic you start hyperventilating, taking deep breaths. The excess oxygen in your system gives you all those sensations associated with panic attacks. So … you need to reduce the oxygen in your system. One method is to breathe into a paper bag as that reduces the oxygen as you will start breathing in the exhaled carbon dioxide. You will achieve the same affect if you just cup your hands over your nose and mouth as you breathe. The second method is to monitor your breathing. As soon as you feel panicky, breathe in a short breath through your nose and exhale a long breath through your mouth. When people tell you to calm down by taking a long deep breath, they’re actually giving you the wrong advice. This type of breathing will encourage the panic attack. Stay focused in the present! Let me know if you have any favorite quotes for anxiety that you would like to share. Next Next post: Love’s Greatest Killer!